Eureka would be a far less lively place without the many murals that uplift its public spaces. Duane Flatmo's transformation of the inescapable bulk of the rear of The Arkley Center into a monumental poster praising the performing arts is the iconic example of what a mural can do. The fabulous array of fauna depicted on a wall at 6th and H streets by the equally fabulous Rural Burl Mural Bureau as well as their giant squid at 1st and F streets brighten our days no matter what the weather. Sculpture in public places has been much less in evidence. In fact, until very recently, the only sculptures owned by the city were Stephen Saks' Fisherman's Memorial on Woodley Island and the beautiful copper-clad pillar by Melvin Schuler in front of the Clarke Museum. Since about 2005, however, subtle additions have been appearing in the city. There's the spot-on placement of Linda Wise's Horse at the intersection of 5th and Myrtle as well as the installation of the munificent gift to the city from the private collection of Jan Milstead: six sculptures along F St. from 6th to 1st St. These marked a turning point in placing sculpture in Eureka's public spaces. Tracking the behind-the-scenes story of the coming together and ongoing collaboration of these art organizations as APP, I found that representatives from the various groups can't seem to say enough about how much they enjoy the process and the people they work with. Talking with Lori Goodman of the Eureka Arts and Culture Commission, Ink People Executive Director Libby Maynard, Roy Grieshaber of the Redwood Art Association (RAA), Charlotte McDonald of Eureka Main Street, Jemima Harr from Humboldt Arts Council and staff of the City of Eureka (Dave Tyson, Cindy Trobitz-Thomas, Kurt Gierlich), I realized that each of these players championing public art has a profound and soulful tale of how we got here art-wise, as well as visions for art in our future. And, I might add, they all tell their tale with an enthusiasm that could wipe blight from the face of the Earth! Because there are many complex regulations imposed by the California Coastal Commission on the permanent placement of anything near the coast, the upbeat people at APP turned this seeming obstacle into a positive opportunity to create, in essence, a continually changing outdoor gallery for major sculptures. To get things started, six acknowledged fine artists in the area were invited to produce sculptures of suitable scale and install them on pedestals arranged as the avenue that effectively extends C St. to its eponymous Market Square and the Boardwalk. The combined resources within APP allowed for the full scope of the project to be presented to the public as a complete, unified experience. The current sculptures will remain in place for one year at which time a new round of entries -- this time, selected by a juried process open to all sculptors in Humboldt County -- will be installed on Arts Alive! Oct. 1, 2011 and so on into the future. All the works are also for sale, and could well find their way into the homes of citizens and businesses who have come to love them. Deadline for entries is Friday, April 1, 2011. These projects are promising manifestations of what is possible when a city and its citizens mature. To embrace where you live -- and celebrate it with art -- is the hallmark of culture. This does not happen without cooperation and an alignment of intelligence and skill. But once established, public art nourishes civility and the intangibles we often refer to as quality of life as well as transforming the very tangible environment we share. As you probably observed, we missed Arts Alive! this month because the first Saturday fell on New Year's Day (and Arts! Arcata doesn't come until Jan. 14). I would invite you to plan a DIY arts walk starting with a leisurely stroll from the Morris Graves Museum Sculpture Garden at 636 F St. Head toward the bay and look for the sculptures placed on the sidewalks along F Street as you enjoy the murals and buildings of the gem we call Old Town. End your tour with the new vibrancy of the C Street Market Square and Boardwalk sculptures. Art in Public Places -- APP -- hmmm, is there an app for that? Yes, there is. Several cities around the country are up and running with iPhone/Smartphone apps guiding you to art in public places. And there's a bit of a buzz here at the Journal about creating one that puts Humboldt on the arts map. We'll see what the new year brings. 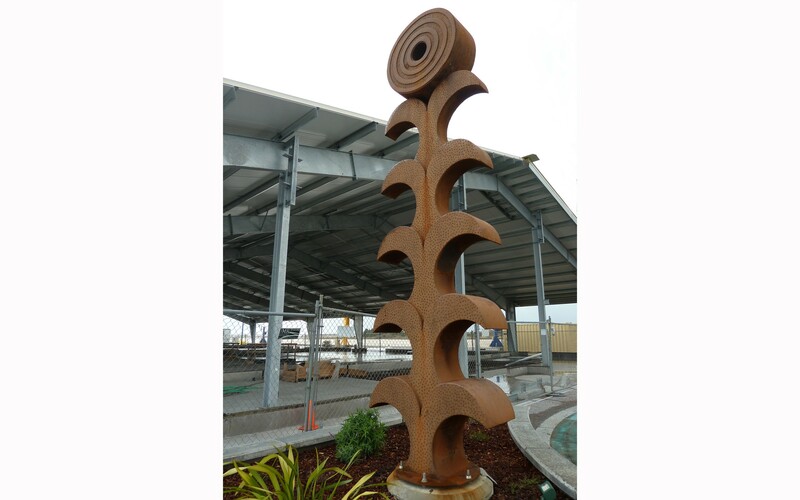 The C Street Market Square juried sculpture competition is open to Humboldt County sculptors -- deadline April 1, 2011. Go to "exhibitions" at www.redwoodart.org for the call for entries form. Deadline for proposals for Water Sculpture Design and Construction is April 15, 2011. Contact Charlotte McDonald at Eureka Main Street, 707-442-9054, for details.